What is Bloating and Gas? A byproduct of the digestion of food. How quickly air or gas accumulates and is passed from the intestines varies from person to person. Similarly, one person’s perception of what “being gassy” or feeling full or bloated varies from another’s. DIGESTIVE FACT – It is not uncommon for people to normally pass gas (fart) up to twenty times a day (MedicineNet). When should I seek medical attention for bloating or gas? 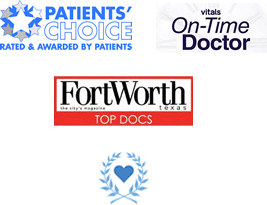 When bloating or gas persist despite dietary changes, the use of OTC anti-gas agents or probiotics, or if these symptoms worsen or cause significant distress, evaluation by a Gastroenterologist in the Fort Worth, TX area is the appropriate next step. Why do I feel bloated or full? Bloating is the subjective feeling that the abdomen is more full than it should be but does not necessarily mean that the abdomen is enlarged. This feeling is based on the brain’s perception and depends on the connection between the brain and the gut. When the abdomen is noticeably enlarged, it is described as distended. Distention is commonly caused by a reaction to certain foods, medications or even stress. Keeping a log of any foods that trigger a distended belly is recommended and will help your doctor make a diagnosis. It’s important to note that feeling bloated is not necessarily the same as having excessive gas. What are common causes of bloating and gas? An inability to digest certain types of carbohydrates. The two most common are lactose intolerance and fructose malabsorption. Patients with Irritable Bowel Syndrome (IBS), Celiac Sprue or pancreatic insufficiency may also struggle with gas and bloating. What are common treatments for bloating and gas? Common treatments for gas and bloating include dietary changes, the use of over the counter (OTC) anti-gas agents like simethicone or activated charcoal, antibiotics and probiotics. Depending on the cause, evaluation by a Gastroenterologist (a specialist in digestive and liver diseases) may be required before prescribing a particular treatment.